Hello there bargain hunters. 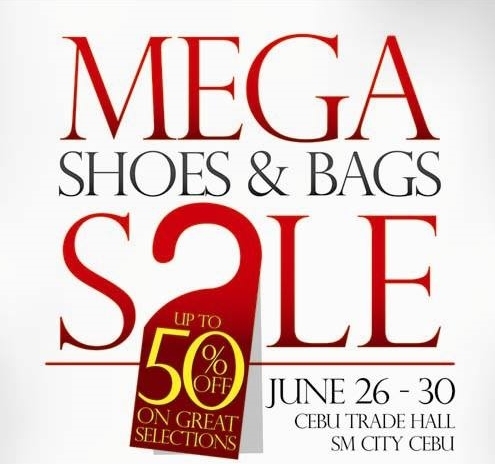 If you are looking for the best shoes and bags in town at affordable prices, better go to SM Cebu starting June 26 for the Mega Shoes and Bags Sale 2013. The sale will be held on SM City Cebu’s Trade Hall and will run starting June 26 up to June 30 2013. Bring the whole family with you for surely you can get the best shoes and bags for each and every member at great discounts. You can also win prizes when you buy these participating brands during the Shoes and Bags Sale. For more great sale and shopping tips in the Queen City of the South. it is best to Like us on the Offical Facebook Page of We LOVE Cebu!! !